Using bark is an extremely good idea for any gardener looking to landscape their property as this product has many benefits which will come to light once the landscaping has been completed. Landscaping a garden will have many tangible benefits for homeowners and the use of bark is generally a good idea for those who want a simple and effective means of insulating their borders. 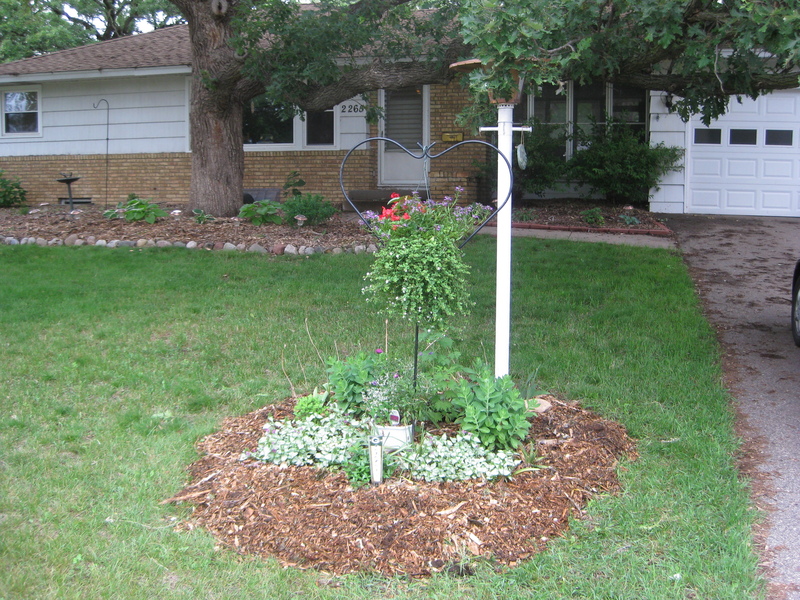 Ease of installation is one of the biggest benefits that you will find from using bark as a landscaping product. It is also an extremely versatile product which can be deployed in more or less any type of garden in any sort of climate. For those homeowners looking to landscape their garden with bark, they will be pleased to learn that not too much preparation is required – just a general weeding of the surface where it is being deployed. The use of bark in borders doesn’t preclude the growing of plant life – you will simply need to deploy the product around the area in which you wish to grow plants. Helping to maintain the moisture levels of the plants in gardens is one of the main benefits to arise from the use of bark in landscaping – the product adds moisture to the areas it is deployed and plant life will benefit from this. Winter can be a very difficult time for the plant life in our gardens and many homeowners will use bark in their borders to help insulate their plants from the inclement, frosty conditions experience throughout winter. One of the biggest reasons that homeowners choose to utilise bark in their gardens is because it will minimise the amount of maintenance that they need to carry out. For example, if you use bark extensively throughout your garden, it is likely to significantly reduce the amount of weeding that you need to do and, as any gardener knows, this is one of the most dreaded and laborious processes in gardening. For most gardeners the never ending activities that make up the hobby, which sometimes may seem relentless, are all part and parcel of the doing the thing they love. There are many materials such as gardening bark and other techniques that can make the whole process a lot more efficient however. Gardeners are highly adaptive creatures who when they are able will use anything that could give benefit to them including gardening bark. Many of the physically demanding but repetitive tasks that gardeners face can often be reduced in time and effort. Weeding is an example of the worst kind of gardening job, that most gardeners would perhaps wish they didn’t have to carry out. 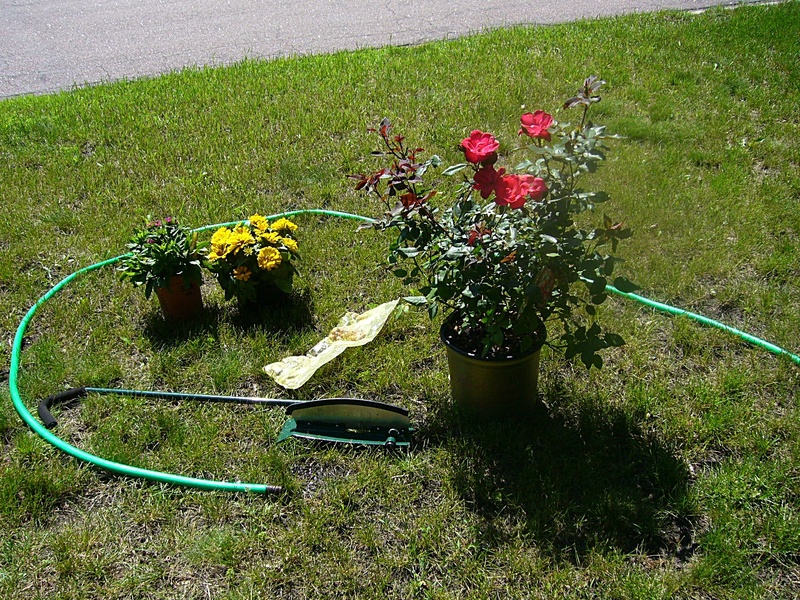 Likewise, having to do the watering during the hot summer months can be relentless and hard work. Watering however is one area of gardening in which alternative solutions have been found to help reduce time and effort of the gardener. Gardening bark helps the gardener perform a whole host of tasks around the garden and is therefore much adored. 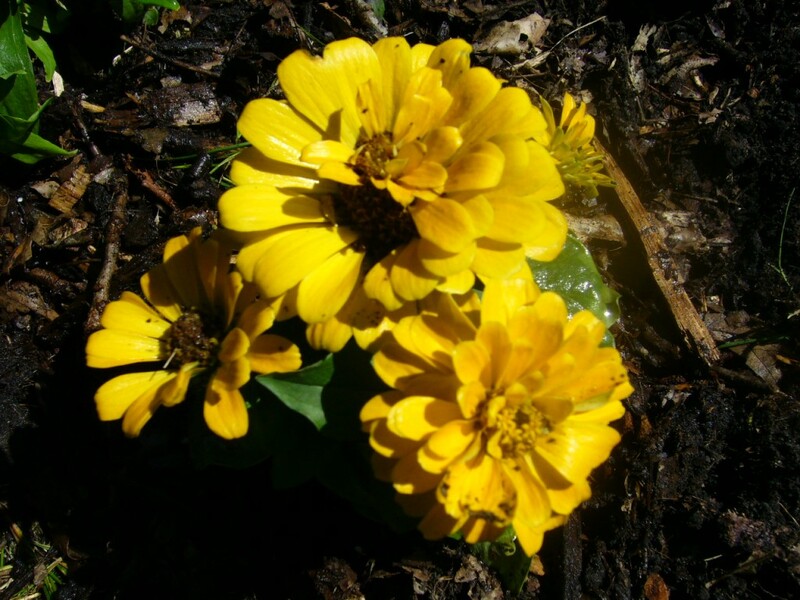 The first great use of gardening bark is that it helps reduce the amount of weeding required. 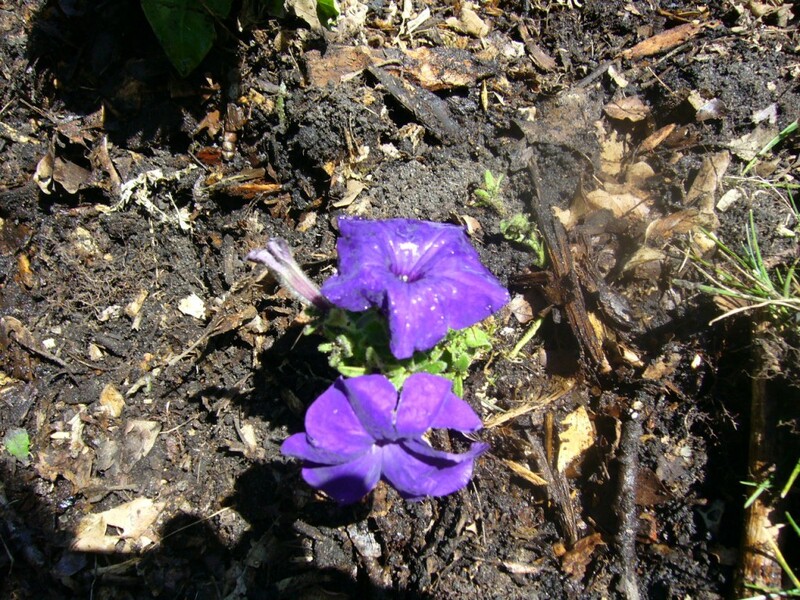 Weeds are prevented from growing when a layer of two or three inches of gardening bark is spread across the whole bed or border – sunlight is stopped from getting to the weeds and encouraging them to grow. Once weeding of the bed or border has taken place, it is then possible to completely prevent weeds growing in the future with the use of gardening bark. 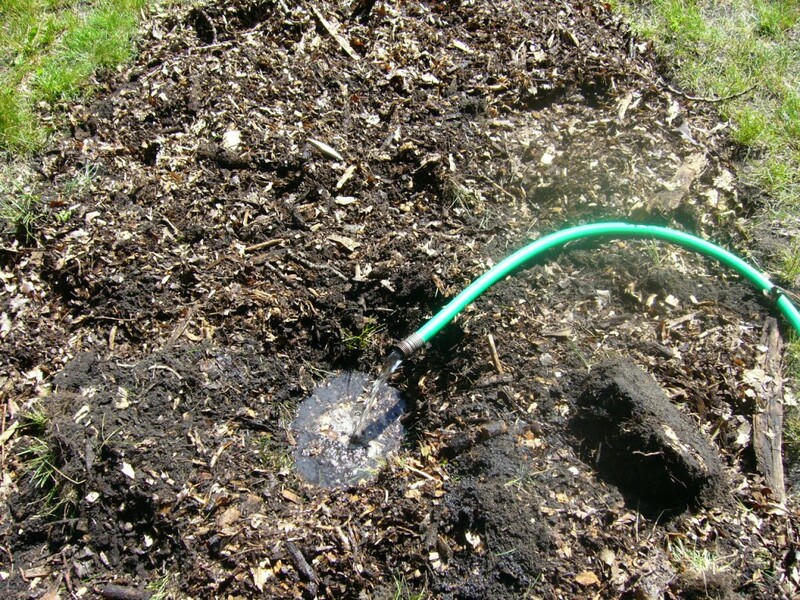 Secondly, gardening bark also helps retain moisture, so that once a bed or border has been watered the requirement to water the area again should not occur for a little longer than if no bark was used. Finally gardening bark helps to protect the roots of plants throughout heavy winters and severe frosts. It is because a layer of bark helps keep in warm air whilst preventing cold getting into the soil. 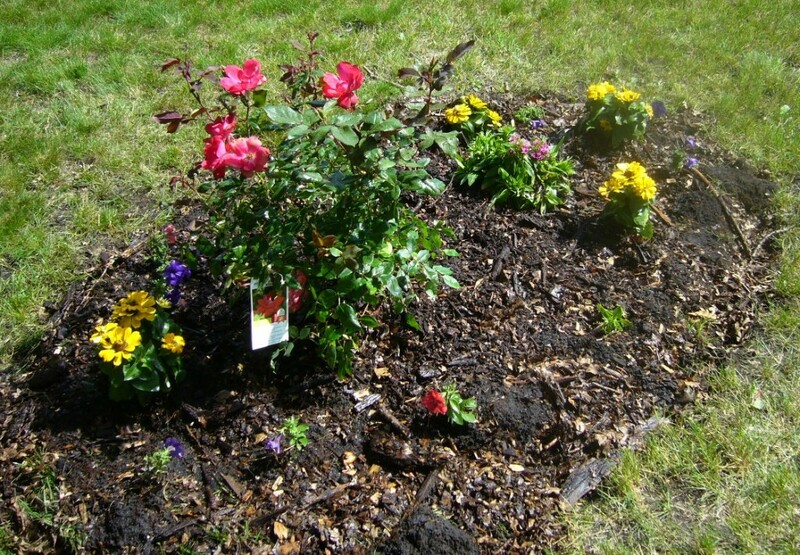 Other types of mulch are also available to gardeners, like plastic sheeting and hay. Those that choose gardening bark do so not only for its excellent properties like water retention, but also because it has the benefit of looking great. On the market today, there are a number of ornamental barks available for gardeners to use for their beds and borders. Planted the first 100 bulbs in this full-sun garden. After a very stormy evening, I made a trip out to my hometown to see if there was any damage since there was a tornado that touched down just west of Winsted yesterday afternoon. Fortunately the tornado touched down in a bean field and did not cause any severe damage or injuries. There were as many as 70 tornadoes that tore through the state of Minnesota during the course of the evening, likely an all time record. Unfortunately three cities did not escape damage. Windom was devastated by the storms. A tornado flattened most of the buildings in town. It will likely take years to rebuild. There were three deaths from three different areas of the state. My heart goes out to their families and loved ones. The weather can change so quickly this time of the year, often with very little advanced warning. Every day brings a new beginning, and often endings – sometimes unexpected, sometimes not. Today is a new beginning for a flower garden in the front lawn. Eleanor (my soon-to-be-mother-in-law) ordered several hundred flower bulbs including gladiola, anemone, allium, and acidanthera. It seems we received a double order and I had already planted the first shipment. Since there was no more room in that garden for more, it seemed necessary to start another garden. Gardeners can never have too many gardens, right? The front lawn at my new home is half shade, half sun. The shade is created by the umbrella of a massive oak tree. 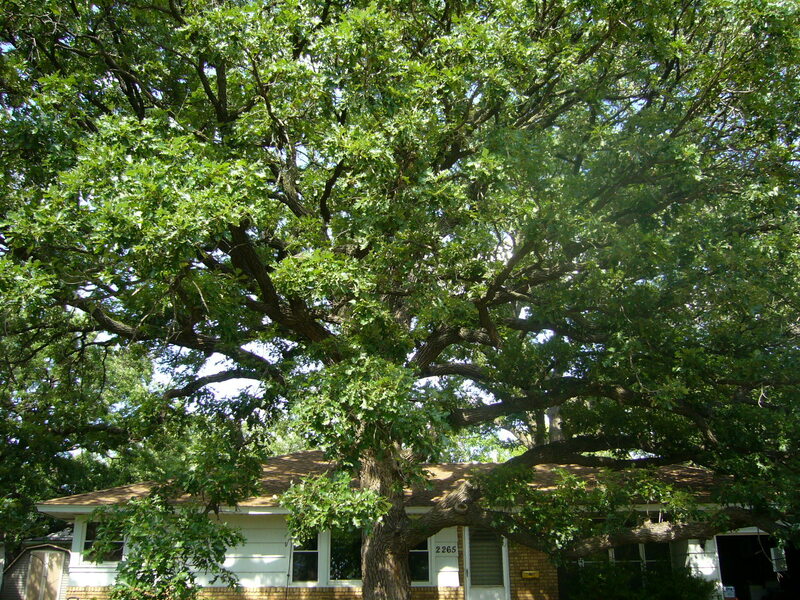 Oak tree in the front lawn provides shade for half the yard. Several years ago, Steve and I landscaped the area beneath the tree because it was impossible to get grass to grow in the deep shade beneath the tree. We covered the ground with black plastic, then hauled in loads of mulch from the free mulch pile and added a border of field stones. We planted several different types of hostas, which have been doing well even though they get very little sun. Hostas are one of my all-time favorite perennial plants because they grow pretty much anywhere and as long as you keep the slugs and rabbits away, they are happy to grow in even the deepest shade year after year. 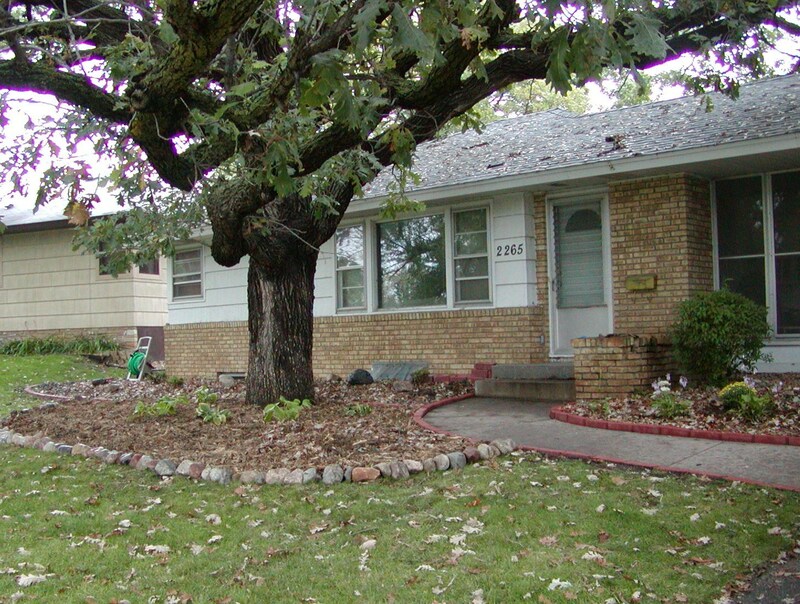 Landscaped front lawn in 2006. After assembling the tools and a quick trip to the local garden center to purchase some sun loving plants, I’m ready to begin creating the new garden. A Double Knock-Out Rose, Zinnias, Dianthus, and Petunias will add color until the bulbs get started. Laying the garden hose out in the shape that I want the garden to be, I use a sod cutter to cut through the lawn. Using a step sod cutter, the garden shape is cut out. Using a flat edged shovel, I dig up the sod, clearing the area that will be the new garden. Because the oak tree roots are just below the surface of most of the lawn, I’ll fill in the areas with organic compost from the very large “compost bin” area beneath the oak tree. The decomposed mulch and shredded oak leaves make a very rich compost for the new garden. The new garden will be somewhat of a raised bed, since I don’t want to dig into the ground and disturb the oak tree roots. This way I don’t have to worry about cutting into underground utility lines either. 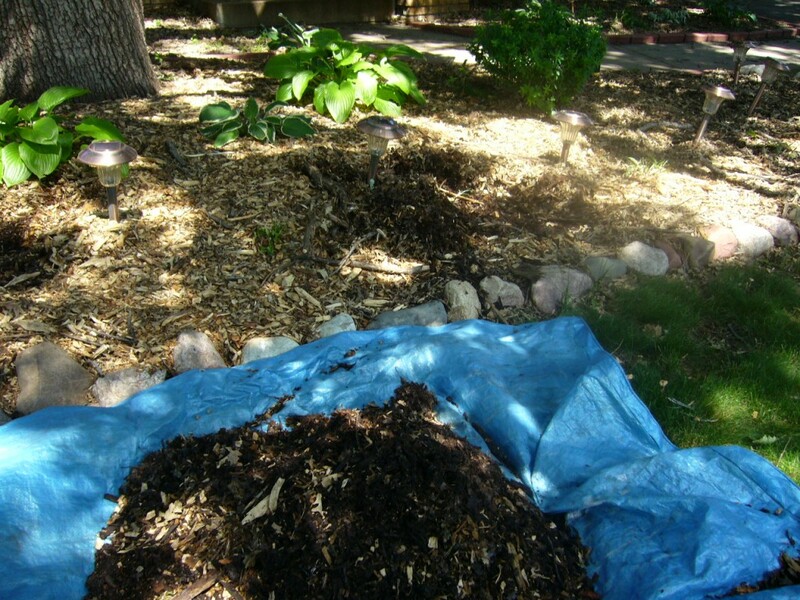 Rich compost made of decomposed bark mulch and oak leaves. 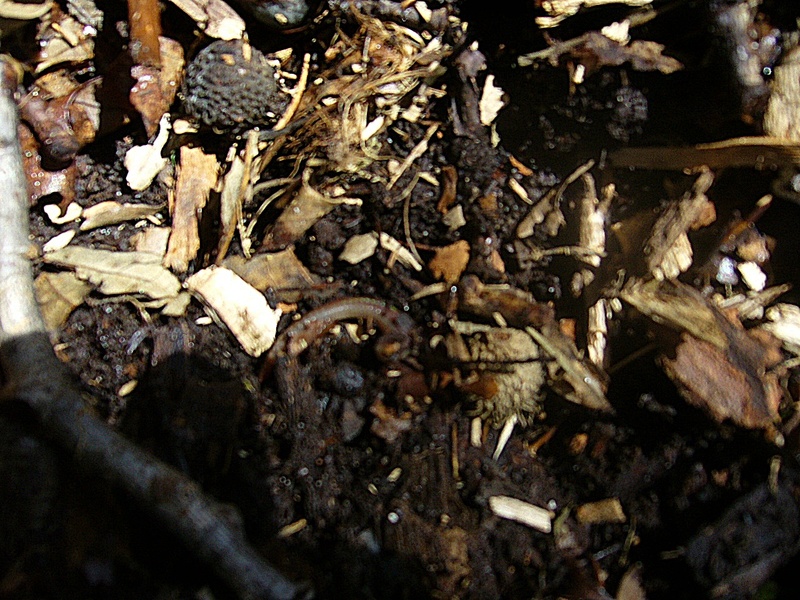 Earth worms help create the compost. 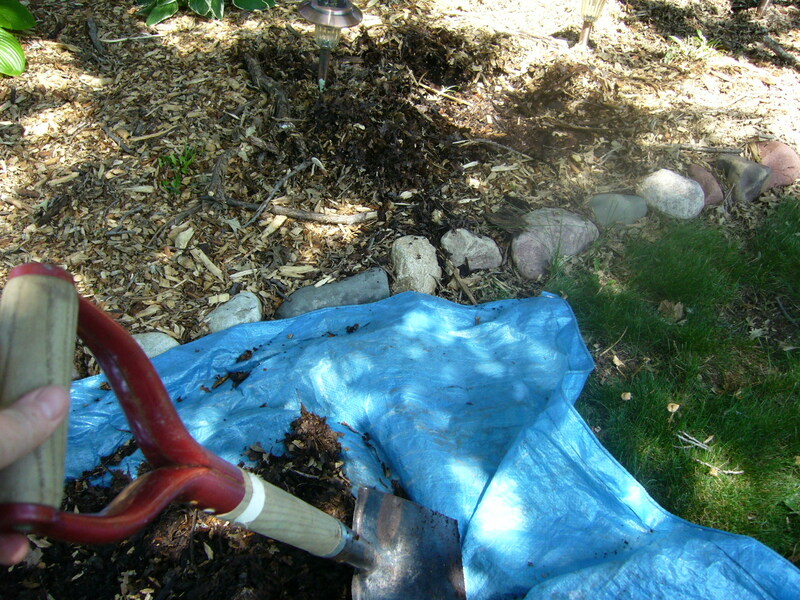 An easy way to transport dirt, mulch, and rocks is to use a tarp. Just load the material on the tarp, drag the tarp to the new locations and dump it off. Tarps work well for transporting mulch, dirt, and rocks to the new location. Now it’s time to plant. A trick I learned from my father-in-law who was an avid gardener, is to dig the hole (three times larger than the root ball), then fill it with water before planting. This works well for tomatoes, shrubs and anything that is transplanted from a pot into the ground. It works especially well for plants that need a lot of moisture and are planted in the heat of the day (it’s 85 degrees and pretty humid as this new garden is being created). It also means that I am officially playing in the mud now. Filling the hole with water before planting the Knock-out rose bush. 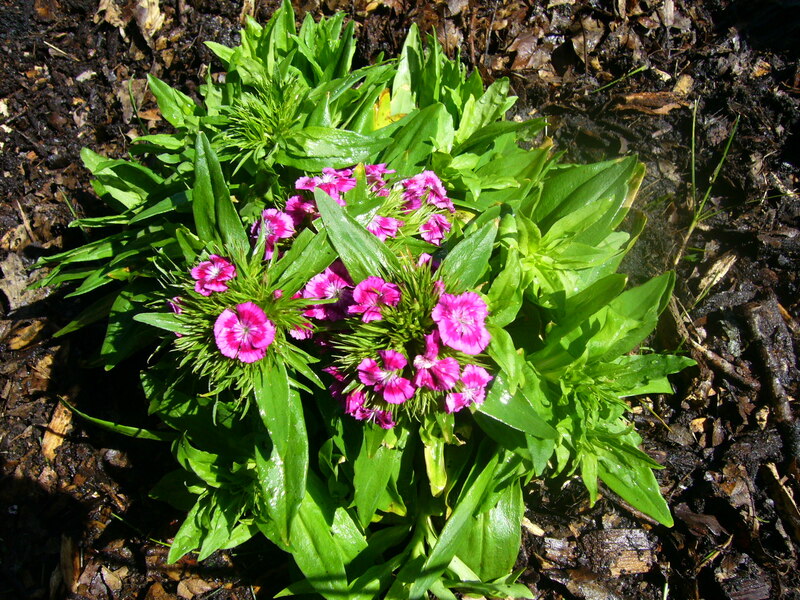 The same method is used for planting the Zinnia, Dianthus, and Petunias. 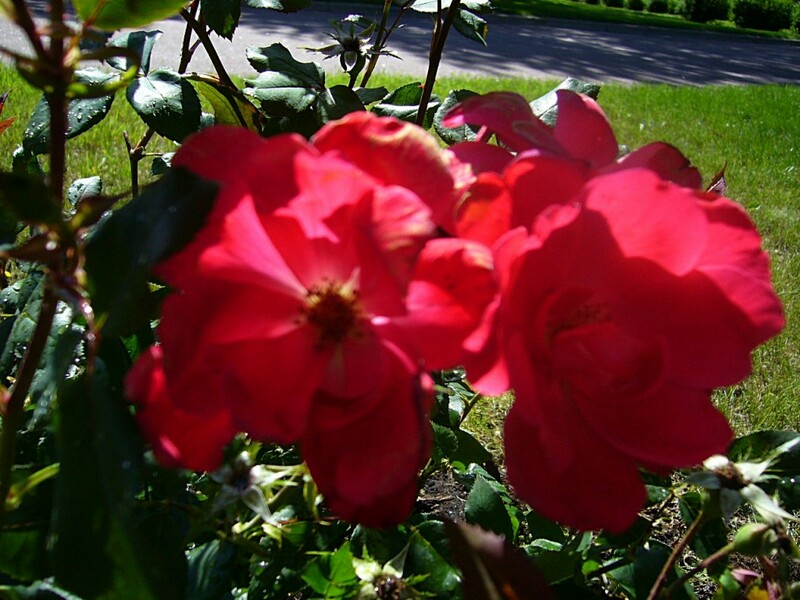 Knock-out Roses, Zinnias, Dianthus, and Purple Petunias provide color until the bulbs grow. Another (cooler) day, I’ll add an edging of field stone to give the garden a more defined look. 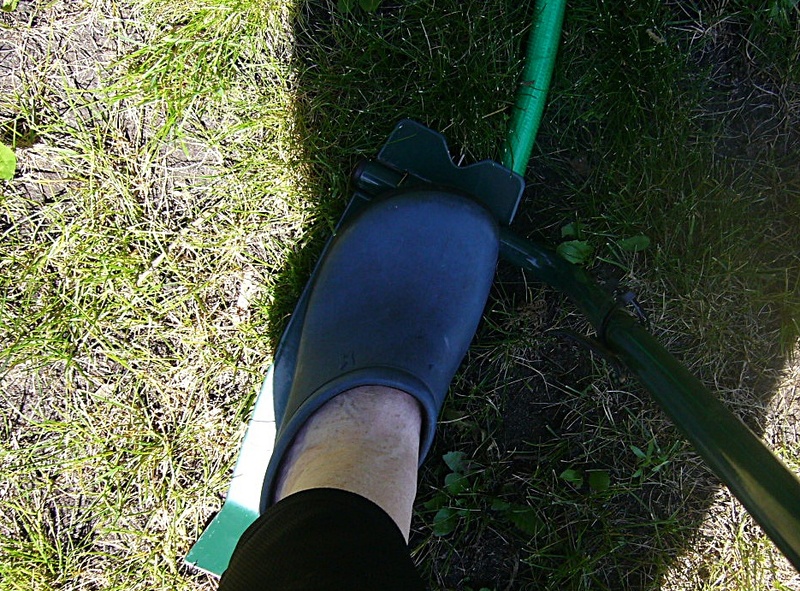 But now it’s time to hose off my garden clogs, cool down, and have a cold beverage. 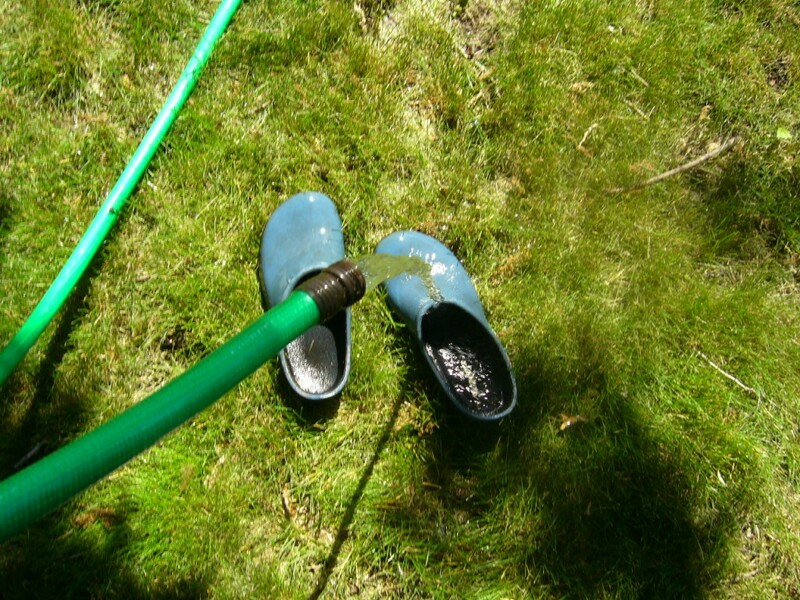 Cleaning (and cooling) my garden clogs and feet.